Contrary information Nigerians and indeed the world has been fed with by the Federal Government and the military, Abubakar Shekau, the leader of the dreaded Boko Haram sect, has refuted all claims by Nigerian military that he has been wounded or killed, saying “I am alive and well.” In two videos just released to Sahara Reporters by Ahmad Salkida, a journalist that specializes in reporting conflict in Lake Chad region, Shekau, also said he is not done with waging war against the Nigerian government. “I am not wounded, I am ready to fight and will continue to fight,” he said as he read from a prepared speech in Hausa and flanked left and right by well-armed lieutenants. Shekau also claimed responsibility for the air force helicopter that crashed recently, although, the military authority had earlier told Nigerians that the helicopter came down as a result of technical issues. The video also showed some girls alleged to be some of the remaining Chibok School Girls saying that they are not willing to go home because they have been converted to Islam. 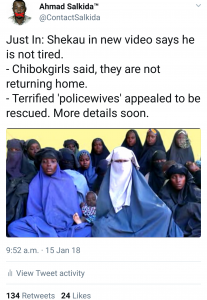 The Boko Haram video also paraded some women believed to be police officers who were abducted in June 2017, the women sobbed as a Boko Haram speaker recited the Qur’an before asking some of them to speak on video, it appears they’re under duress as they were surrounded by armed Boko Haram fighters. 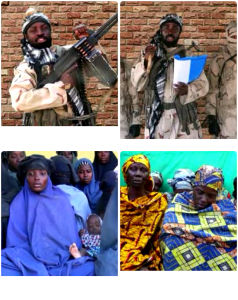 The videos which also show Shekau firing relentlessly from his gun were released today, Monday, January 15, 2018 and it also showed some members of the sect who were heavily armed operating freely in an open. Source: Sahara Reporters, New York.